I had a different post planned for today, but then I went to my mom's house and made an apple pie with her today so all plans changed. On my way home I stopped off to get a bag of Jonathon apples and a box of crust mix so I could have my own pie. This is the first time I have made an apple pie without my parents. Crust is not my friend, so it doesn't look pretty. You have been warned. 2. Peel, core, and slice the apples. 3. Taste an apple slice to see how tart/sweet they are. If they are sweeter use 2/3 cup sugar instead of the full cup. 4. Mix together the flour, sugar, cinnamon, nutmeg, & salt. 5. Make your bottom crust and lay it in your pie pan. 6. Sprinkle a layer of the flour mixture on the bottom of the crust. 7. Put down 1 layer of apples & sprinkle more of the flour mixture on them. Continue until the pie pan is filled (go a little higher than the pan because it'll sink down). 8. Sprinkle the last of the flour mixture on the top layer and dot it with the butter. 9. Make your top crust and lay it on top of the pie. 10. Go around the crust and make the pretty edging. 11. Add vent holes evenly around the pie. 12. Sprinkle cinnamon around the top of the crust for prettiness. We recently got a really, really cool thing called a Victorio Apple Peeler. It made prepping the apples a BREEZE. I took a video on my phone. It is so cool! I can't wait for our upcoming apple canning weekend because it will be so much easier now! Not pictured is the rolling out process aka my nemesis. Lay your apples. It is imperative to do it super OCD-like like I do. Start breaking apple slices into little bits that you can sneak into tiny spaces to made this as solidly apple-filled as you can. This helps stop the pie filling from sinking far below the crust during cooking. Voila! 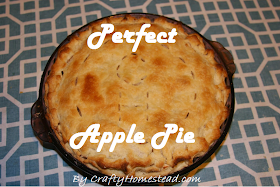 The first Crafty Homestead apple pie! I'm sorry mom, but it was the best apple pie I've ever had in my life! 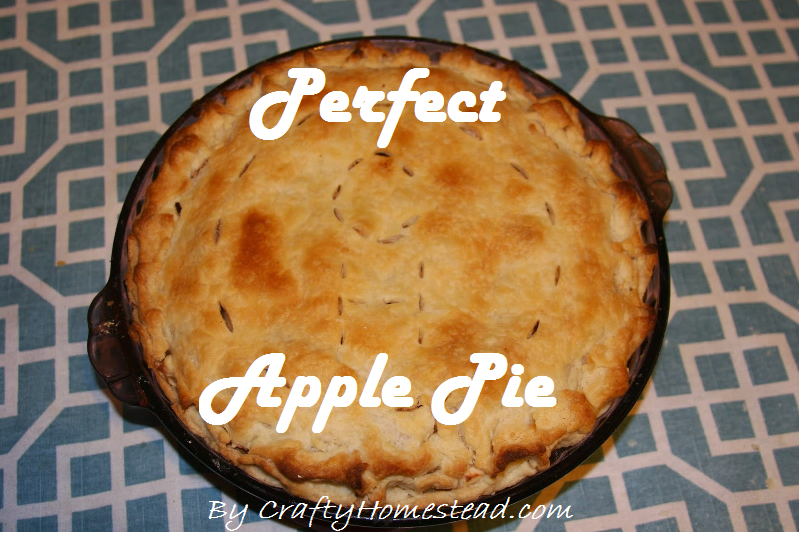 How should an apple pie look, if not like yours? Glad you enjoyed it! Tastes good when you make it yourself. PS The video is private, so I could not see it.